Yes, I have a secret academic life--I'm taking a class in Advanced Formal Poetry Writing at the local university. I adore it with all my heart and will be so sad when it's over. I've written blank verse, a sonnet, a villanelle, rhyming quatrains, and a poem in trochaic meter. It's my Useless Superpower: the ability to write absolutely anything using only iambs. If you need something redone in iambic pentameter, send it my way. I'm your man. And so I learn a new word from you Anna - iambs. Who would've thought? Mental note : iambs is a good scrabble word. You never cease to amaze me Anna. oh, how funny! I was a high school English teacher and while I adored teaching poetry, I was always a little tentative with the meters :) It seems that a certain ear is required for it. I hope you share a few of your poems! Good for you! I'm considering taking a class in Shakespeare this year! I went to a outdoor performance of "A Midsummer Nights Dream" a few years ago, and was astounded and dismayed that I couldn't follow it at all due to the archaic Old English! Behold! You amuse and inspire us! What fun!! I missed out on college due to poor health, but now that I am much better, I would like to go....eventually. Hubby is in school now, so when he is done, I may have a turn. Homeschooling keeps my brain sharp for now. Wonderful! Please do share some of your work! Have you ever read the book, A Suitable Boy, by Vikram Seth? It is a huge (meaning 1000+ pages) book about a family in India and it's one of my favorites. The kind of book that you slow down towards the end because you can't bear to have the story stop. Anyway, I mention it because one of the families in the book have a family habit (for lack of a better word) where they make up rhyming couplets to comment on whatever is going on. For some reason your post made me think of it. I haven't read it, but my poetry prof is friends with the author and has mentioned it before. Also, I think Seth wrote a very long series of sonnets that sold really well--making all the other formalist poets grit their teeth. 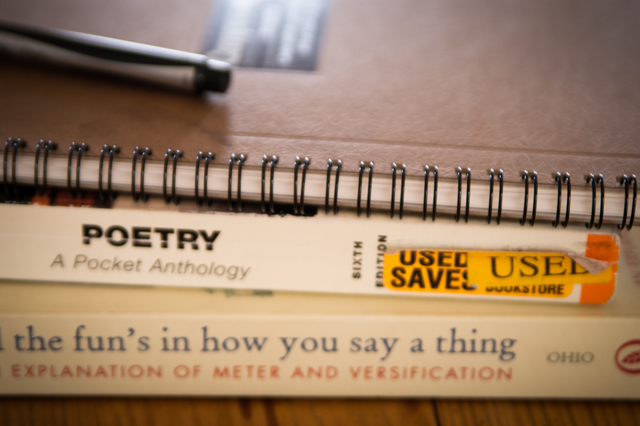 We enjoy poetry in our homeschool, or family life, most every day. We just read it! That's all for now! I really enjoy the way you put your words together...using an economy of words. Mary Brooke in Atlanta. I love this! I have a master's degree in poetry (talk about a 'useless' degree....:))and this course sounds wonderful. A well-written villanelle is a marvel. I love reading poetry, but writing it is another story. Kudos to you! I teach ESL and have been using poetry in pronunciation lessons. It is amazing how much the students enjoy it and how effective it is! Check The Ode Less Traveled by Stephen Fry. He encourages writing poetry for your enjoyment. 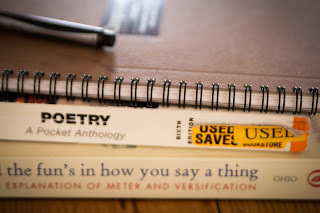 We are using it for poetry study in our homeschool with my teenager.